Third Iron and EBSCO work together to automatically sync holdings for our mutual library customers. If you use EBSCO A-Z or Full Text Finder and would like auto-holdings please contact us at support@thirdiron.com and we would be happy to coordinate with EBSCO to set this up for you. Note that it takes about a week on average to receive your first file. Below is information for manually doing this same process in case that is desired for your particular circumstance. 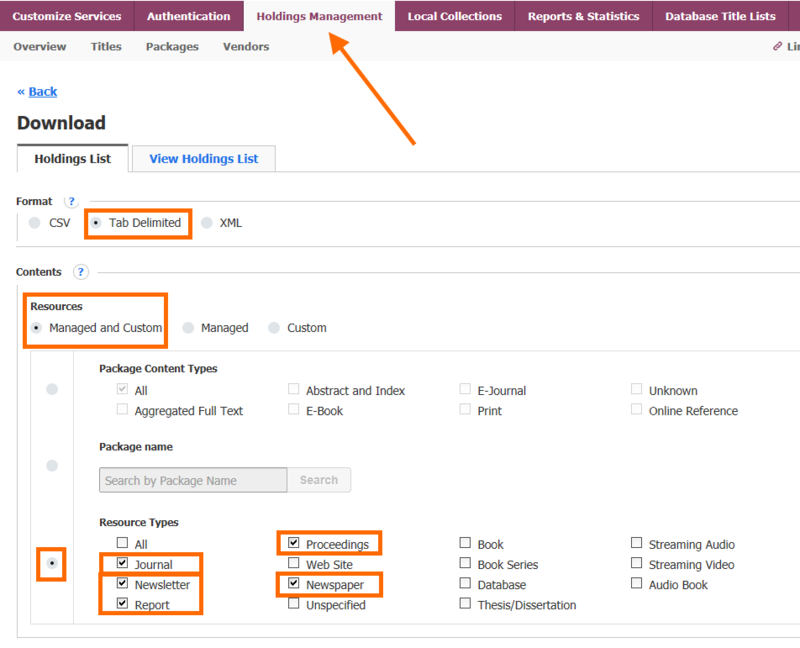 Subscriptions are setup by using actual library holdings. Third Iron recommends updating these holdings on a quarterly basis or whenever you have a known significant addition/loss of content to your library to help keep your holdings accurate. Updating your holdings typically takes less than five minutes. Resource Types: Journal, Newsletter, Report, Proceedings and Newspaper. Below this screen is an option to name the file, and then download it. by following the instructions provided. We will notify you when your holdings have been loaded for your library.